Dog Health & Safety | What's Really in Your Dog's Food Bowl? I grew up believing that processed commercial dry dog food is what you fed your dog. You bought the cheapest stuff on the shelf at your local grocery store which likely was what your parents fed their dogs. After all — it’s just a dog and there was really nothing else to know about it. Once in awhile you’d toss Fido a bone or some table scraps and he was happy. You never gave a thought to reading the ingredients label. Why should you? You mindlessly believed that commercial dog food manufacturers knew what they were doing and that they cared about what you fed your dog so they put nothing but good things in it. The bag said “dog food” so you didn’t question it, it’s just how things were. When my children were small there was no such thing as reading ingredient labels. I trusted that the food manufacturers knew what they were doing and that what they put in whatever they made was good quality stuff. I believed their commercials, bought their products — and didn’t check if what I was feeding my children really was nutritious. Wasn’t this was all taken care of for me? Buy it, feed it, done. If I didn’t read the labels of my children’s food why would I read dog food labels? I’ve always been one to want to make my dog’s meals as tasty as I can and give them a variety of foods which of course, includes people food. I’d add things like canned soup and vegetables to their meals. The problem is that there’s quite a growing list of ingredients in people food that can make a dog very sick and even kill him. Because there has been found to be so many ingredients that are harmful to dogs in people food — I now read labels and I read them two or three times before I buy anything because the print is so small it’s easy to miss something. I’ll even read the labels again on things that have been in my cabinets for awhile because I’ve found that between the time I bought it and the time I want to feed it there may be something new found to be harmful in that can. I’m also only human and can mistakenly buy something for them that I don’t realize at the time of purchase may be harmful. 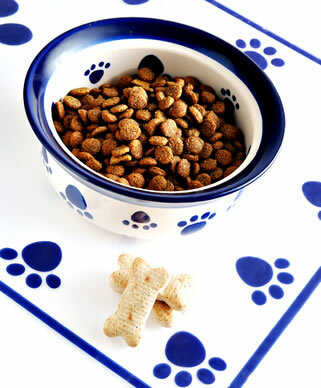 Pet food makers use preservatives such as Ethoxyquin, BHA, BHT and others to give longer shelf life. These are are toxic to dogs. I don’t know of any dog that’s dropped dead on the first meal. These are sneaky killers because they slowly build up in your dog’s system which is like silently poisoning your dog. I learned about these preservatives probably 20 years ago or more when we got our Yorkie, Damien. But My VET RECOMMENDS IT! Many vets sell name brand pet foods, the same foods which I found out years ago contain the preservatives I mentioned above. You’d think a vet would know better. Not always so. They’re human just like anyone else and can be just as misinformed or tempted just like anyone else. Don’t kid yourself, there are also vets that stock and recommend these foods because they get some pretty lucrative kick-backs. Yup, in some cases it’s all about the money and what the pet food manufacturers give them as “rewards” for selling their food. I’m not labeling all vets as greedy idiots — certainly not. But there are a large number of them that really could do with more education and less on the side of greed. I think it would be very cool if all the vets in our country banded together and stood up to these pet food makers forcing them to remove the harmful ingredients from their products. That’s a pretty far fetched idea but putting a huge dent in their sales would certainly make these manufacturers sit up and take notice. I think some vets try really hard to keep up with all the latest treatments for pet ailments and some are even interested in pet nutrition. In order to further their education there are conventions and seminars available to them. But who sponsors some of these events? You got it! The pet food manufacturers that put the poison in the food in the first place! What a perfect place to push their products! Thank goodness someone some where along the way starting investigating what’s really in commercial dog food! I don’t have a clue who started this adventure but if he or she were standing in front of me I would thank them from the bottom of my heart. What they started ain’t over yet and I hope it never will be! The movement into canine nutrition is growing! More and more people are taking the time to learn what dogs really need and changing their dog-feeding habits for the better! I stumbled into more seriously investigating and researching dog food when I realized within days after Riley came to live with us that something was wrong. He’d been a stray so no one knew how long he’d been on his own scavenging for food. He wasn’t skin and bones but he was thin. The vet wanted him to gain a few pounds but he wouldn’t cooperate. When I was growing up, my Dad put dry dog food in their bowls and the dogs ate it. Not Riley! It seemed awfully strange that a dog that had probably been digging in the trash and eating garbage to survive would turn away from his bowl of dog food. People told me I was driving myself insane because a dog would eat when it’s hungry. But did I have to let my beautiful dog go hungry for days on end because he wasn’t interested in eating what I put in his bowl? Should a dog be forced into survival mode in their own home and eat every few days just because he has to in order to survive? No! I finally realized Riley was telling me something and that something was, what was in the bowl was not good for him and so he wasn’t going to eat it willingly. It’s not like a dog can drive over to the grocery store and buy their meals. Riley was my dog, my responsibility and it was my job to see to it that he was healthy and happy. I joined a German Shepherd forum board, did a lot of reading and asking questions and followed links all over the Internet. I learned about things like grading dog food. I learned from a gal that bred Shepherds and ran our then local pet supply store that even though the dry food I’d been feeding Riley (Canidae) got an e A+ grade — it’s not always the best choice for putting weight on or keeping it on a German Shepherd. So, we switched dry foods. No change. So we switched again, and again and again — about every 3-4 months we switched foods because each and every Grade A food we tried didn’t do for Riley what he needed it to do, and he just was not interested in eating it on any kind of consistent basis. So, then we switched to Grade A canned food which is expensive and so we mixed dry with it to save a little money. No change. Went to straight canned food – name brand after name brand. Nothing worked to put weight on him. Nothing worked to get him to eat like a “normal” dog. The canned food made for messy stools. During the entire food switching process I learned that many dogs have allergies to the grains in processed commercial dog foods and that grains were many times the main staple of dog foods — makes a great cheap filler for the manufacturer! As if that’s not bad enough, some dogs can have behavior problems that have been associated with some of the ingredients in some dog foods. The worst part of this is that one of the top reasons dogs are euthanized are due to behavior issues which means people are killing their dogs as a result of what they’re feeding them! If your dog is displaying aggressive or other unsavory characteristics — try changing his food before you kill him! You may have to try several different foods but at least give your dog the benefit of the doubt. So we then went through the whole dry/canned food switching but stuck with nothing but grain-free products. To make things even more difficult, every few months whatever Grade A food we were currently feeding our dogs would be found to have some harmful ingredient in it and/or was being recalled. So, we’d switch again. Ugh. I really thought I was going to run out of quality food options and let me tell ya — I was getting dizzy! One of the really cool benefits of feeding grain-free dog food of most any kind is that grain-free solved one really disgusting issue for us. You know how some dogs will eat their own (or another dog’s) poop? Yeah — Nissa was a real pooh-connoisseur — ugh — absolutely DISGUSTING! That was definitely a period in our life with her that we were very grateful she’s not a kissy dog! There are at least three different schools of thought on why dogs scarf up these revolting snacks. It’s a learned behavior — the Mother dog keeps the whelping box clean this way and the pups learn from the Mother dog. They’re missing something in their diets that they try to find (or maybe do find?) in dog poop. Dogs are carnivores so their systems simply can’t process grains. Their natural diet does not include fruits, vegetable or grains. Ever feed your dog corn? Yeah — you can see the undigested corn in their poops. The dog thinks there’s something that tastes good in the poop and so they eat it. Number 3 was what we found out was Nissa’s reason for eating poop. Within two days of feeding nothing but grain-free this problem was solved. This didn’t solve all our problems but I count this as one of the best things that came out of my dog food learning curve. Each Step Forward is ONE STEP BETTER! At our house, we believe that if you really care about your dog — you care what you feed them. Although at this point I hadn’t found the perfect solution to our dog food issues, with each step things got better. Riley gained the weight he needed to gain and even a couple of extra pounds but he continued to have bouts with a touchy tummy and would vomit every few weeks. Both dogs have beautiful shiny, soft coats and are in excellent health. At Riley’s last vet check, the vet raved about how white and clean his teeth are — and no — that’s not from giving them dental treats either. I’m convinced all those crazy things do is coat their teeth with slimy stuff and cost money. It’s not from brushing their teeth either. There’s no way I’m going to put my dogs or myself through that! The better the food you feed your dog the more healthy it will be. People who feed cheap grocery store dog foods spend more money at the vet (if they even bother to take their dog to the vet and way to many don’t) because their dogs may wind up with allergies (and allergies are not easy to diagnose – cha-ching!) the need for dental cleanings and other health problems that could well be avoided by feeding a quality food. Those $25 bags of cheap food can wind up costing you much more in vet bills. 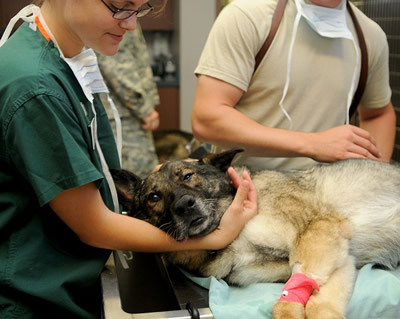 The bigger the dog the more a dental cleaning costs because the more a dog weighs the more anesthetic it needs and the major cost is the anesthetic. Because many people put their dog’s health low on the priority list, many dogs live their lives in misery. For example — would you like to live your life scratching yourself raw? That’s just one example of what can happen if there are ingredients in your dog’s food that he’s allergic to. When you’re not feeling well you may be grumpy and snap at people. When a dog’s not feeling well it too may snap at people, but in the dog’s case — snapping at people could buy it the Needle of Death because their uninformed owner thinks it’s got a behavior problem. Should You TRUST COMMERCIAL PET FOOD MAKERS? I won’t kid you, feeding high quality commercial dog foods is expensive! Aside from a lack of education on the part of a large number of dog owners, the expense is probably the top reason that more people don’t feed good quality dog food. There are still to many people that think of dogs as some kind of secondary level life which is so very sad considering how much dogs give to people if we let them. We don’t have a problem paying for quality food because we feel strongly that our dogs are worth every penny. If feeding these foods would have cured all the issues we’ve encountered we would stick with what works. But we still aren’t where we wanted to be and there’s always the possibility that someone will find something unnecessary and/or harmful in whatever food were currently feeding. The big name dog food makers that you see commercials for on tv and ads in many magazines put their money into selling you on their products not into true dog nutrition. They like to be “in your face” so that you don’t forget their names which does nothing for the quality of their foods. You probably won’t see ads on tv for the higher quality dog foods and the print ads you’ll see for them are pretty much limited to the popular dog magazines and web sites. I think they do a much better job of trying hard to make a better food and that’s where their money goes which is a credit to them. Think about this — no matter what it is, if you have a good product you don’t need to splash your name all over the place — word of mouth will do the trick for you. One of the biggest lessons I’ve learned through all of this is that I don’t trust commercial dog food manufacturers. Their main goal is to make money and in doing so they over price what they sell and include cheap ingredients masquerading as fancy packaging lingo which allows them to make huge profits at the expense of your dog’s health. If you knew the damage that could be done — you would never allow these popular commercial products in your dog’s food bowl. You couldn’t pay me enough money to purchase our dog’s food at the grocery store and buying at a pet supply store is a very close second to that, although it does make me smile that some pet supply stores are now starting to stock the better foods. If you can’t break away from the dry dog food habit, at least research and consider feeding your dog a high quality food. I’m on a very strict limited income so the cost of dog food is the same issue as my cost for food. What can I do to compensate for this problem? I understand your concern. I feel strongly that most people do not consider the benefits of a raw diet nor do they weigh them against the cost. Processed commercial dog food has additives and ingredients that can literally *cause* health issues. Many dogs are allergic to grains for example, so by feeding a grained dog food you are contributing to your dog’s allergies and causing your own vet bills to happen. The same is true for the preservatives, they can cause illness requiring vet visits, medicines and treatments. Since our dogs have been on their raw diet (about 3-4 years now I think it is) I can tell you that our Nissa used to get ear and urinary type infections 2-3 times per year *each* requiring vet visits, urine and ear sample testing, sometimes blood tests plus the cost of the medications to cure the infections. She has not had one single infection of either variety since being on the raw food diet nor has she had any other health issues. Riley use to vomit for no apparent reason every 6 weeks or so. He has not vomited since being on the raw food diet thus the only logical conclusion is that something in his commercial food didn’t agree with him. Both dogs would require dental cleanings once a year if they were on commercial dog food ($250.00 per dog per year = $500.00!!!). They do not require dental cleanings at all on the raw food diet. So if you add up the overall savings on dental cleanings alone, Riley is 7 years old now and would have needed six dentals for a total of $1,500.00 over six years. Nissa is 6 years old so would have needed five dentals for a cost of $1,250.00. Together that’s $2,750.00 that we have *not* had to spend on our dog’s teeth care and by now dentals would probably cost more like $300.00 a dog per year because the $250.00 pricing is several years old. Our vets eyeballs pop in amazement when they open the dog’s mouths during examinations and see their beautiful teeth and are quite surprised *not* to see the muck and yuck stuck in their teeth that commercial dog foods produce. Our dogs do not offend people with their dog breath either because they don’t have dog breath. We honestly feel our dogs have been healthier on raw and have all of the above to prove it. I think one thing people don’t realize is the amount of food a dog needs when on a raw diet. I had visions of just dumping meat willy-nilly in the bowl and setting the bowl down for them to eat. It doesn’t work that way, I had no idea you had to weigh out the portions until I learned how this works! Each of our dogs get about 11 ounces per meal. So, being fed twice a day that’s 22 ounces per dog per day, a total of 44 ounces er day. We are feeding two 80 pound dogs, it sounds like you are only feeding one dog of an unknown weight. If you have a small dog your dog won’t need nearly that much, you may only need a few ounces of meat which might equal for example the weight of a McDonald’s Quarter Pounder burger minus the bun and toppings. Depending on the size of the dog that might be a full days serving not a per meal serving, meaning a pound of meat might be four meals for a smaller dog. In today’s market chicken thighs are one of the more inexpensive cuts as are the beef hearts we get from our local meat market. We get chicken thighs from Walmart in ten pound bags at a cost of $5-$7 for ten pounds of meat. The rest of what we buy at Walmart are the marked down meats and the dogs get what’s marked down. If it’s not marked-down we don’t buy it. We take it home, portion it out and freeze in individual portion zip lock bags or in double portions so that all I need to do is cut it in half. Our beef hearts we order in 20 pound bags (our market sells pet quality beef hearts) bulk pricing at $1.49 a pound. They slice it in one inch slabs which I then chop up 2-3 slabs at a time into assorted sized pieces and toss in gallon zip lock bags into the freezer. Liver is cheap as are kidney and other organ meats. These aforementioned meats are pretty much considered the staple foods for a raw meat diet. You don’t have to feed your dog pricey steak or beef roasts! They should have more of a variety than the staples I mentioned, so toss in some other meat varieties when you can find it on sale. We do spend more money on our dog’s meats than the average person would, but that doesn’t mean you have to. We don’t either, but I have a husband who thinks they need a good steak or rump roast now and then, LOL! I don’t argue as long as it’s got the marked down price on it. Pork is also less expensive than beef. I suggest you research into what portion size you’d need for your dog, then do some “window” shopping for prices and then the math for what it would cost you to feed your dog a raw diet. I’m fairly certain you’ll realize it’s not all as costly as you might be thinking. You can check with your hunter friends, they may share their kill with you for free especially the portions or scraps that they are going to throw away. 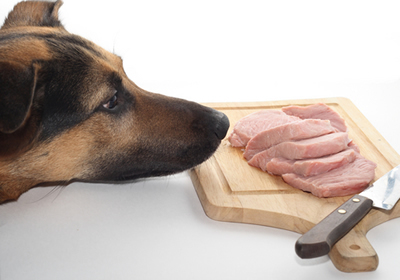 Check with your local meat markets, they may be able to provide you with pet quality meats. Our meat market is really getting into the raw dog food diet and offering more and more in that line quite regularly. You may find yourself having to cut away a bit more fat but the price usually reflects the lesser cuts thus you have “pet quality” meats. Find friends, relatives or others in your area willing to go in with you and buy in bulk then share it. I have a gal at work that butchers a cow once or twice a year and she gives me some of the cuts they don’t want. We get liver, oxtail (one of Nissa’s favorites!) and a few other things from her for FREE. Ask friends or relatives for the meat in their freezers that they are going to toss out when they clean their freezers is another option.